The GURPS After the End series has enabled heroes to get into post-apocalyptic action faster than ever. Now, the latest issue of Pyramid expands those possibilities! With Pyramid #3/90: After the End, your wastelands explode to life. Its feature article is Jason "PK" Levine's expansion on mutant powers, with over two dozen new mutations to make your weirdos even stranger. Roll on the included table, or buy what you want! This issue also includes expanded survival rules perfect for After the End adventurers, letting you catch fish, start fires, find water, and more. But that's not all! This "survival pack" of prose provides tips for transforming GURPS Dungeon Fantasy monsters into post-apocalyptic threats, insight into adding GURPS Reign of Steel robots to an After the End game (or vice versa), and much more. 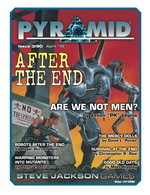 It's never been a better time to build an exciting new world on the ashes of the old, thanks to Pyramid #3/90: After the End. Pick up this issue individually, or subscribe today to get that warm glowing feeling for months to come!